The Club was established by the late Elmer Griffin, uncle of celebrity businessman Merv Griffin, as a place where Twentieth Century Fox and MGM executives could meet, socialize, conduct business and play tennis. During the early years of operation, when many other area clubs were not admitting entertainers, many sports and socially minded celebrities joined the Club. The Club quickly became a haven for film industry personalities and entertainers as a favorite place to play tennis, and to see and be seen. Early Members included Cesar Romero , Humphrey Bogart , Errol Flynn , Ann Sothern , Jack Lemmon , Edie Adams , Ernie Kovacs , Robert Montgomery and Oscar Hammerstein to name a few. Although the Membership at Beverly Hills Country Club is now more diverse, the Club’s Membership still includes top celebrities, athletes and executives." The Club’s fabled story begins with Elmer Griffin. In 1926, Griffin opened the Westside Tennis Club, as a club for actors and entertainers who were shunned by the elite clubs of the time. The Club became a special gathering place some of Hollywood’s most famous actors of the time, including Humphrey Bogart, Errol Flynn, Caesar Romero and Joan Bennett. Over the last 90 years, the Club has changed names and changed hands a number of times, but has never lost its inherent appeal to the residents of Los Angeles. Bobby Riggs, 18-year-old Franklin High School boy, seeks his second local tennis crown in two days this afternoon when he plays Elmer Griffin for the county singles championship on the court of the Bath and Tennis Club in Cheviot Hills. Riggs was crowned Southern California interscholastic titlist yesterday at Fullerton. He is the national junior champion. Griffin, twenty-two years older this his foe, won the California State singles crown fifteen years ago. To a cynical, "Wasn't Cheviot Hills part of the West Los Angeles 'sticks' at that time?" Frans continued his half amused recital. After his retirement, he came to California, only to become so enthusiastic over real estate development that he re-entered business, sponsoring the tract now known as Cheviot Hills and building and organizing the Palomar Tennis Club, now known as the West Side Club. He was also one of the founders of the California Country Club. Regardless of who started the club, it has had unusual staying power, even if its names have not. In April 1927, the club hosted whippet racing. ( LA Times, March 27, 1927 .) Cheviot Hills subdivider, Frans Nelson (who lived up the street), using the event to promote home sales, put up the purse. On December 8, 1932, the Los Angeles Times reported that "The name of the Palomar Tennis Club has been changed to the Pacific Coast Tennis Club." Art Park was the "professional in charge." Apparently, the club used its original name again during this tumultuous year. May 17, 1934, Beverly Hills Shopping News advertisement for American Legion Post dance for "ex-service men in Beverly Hills, Westwood, Monte-Mar Vista , Cheviot Hills and Culver City." 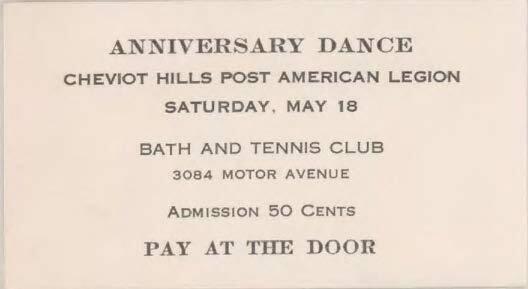 Tickets for events hosted by the local American Legion Post at the Bed and Bath Club in 1934 & 1935. West Side Tennis Club will initiate the outdoor swimming season with a pre-Olympic review of local champions at the opening of its pool in Cheviot Hills this afternoon at 2 o'clock. This is the first of sixteen outdoor meaets already sanctioned by the Southern Pacific Association A.A.U., according to C. P. L. Nichols, chairman of the swimming committee. For this afternoon's program Fred Cady, Olympic diving coach for the Berlin Games, has a choice selection of Olympic prospects, headed by 13-year-old Marjorie Gestring who stunned gray heads of the swimming world by her recent barnstorming debut at the Chicago indoor nationals championships last month. At the age of 13 years and 268 days, Marjorie Gestring won the gold medal in 3-meter springboard diving at the 1936 Summer Olympics in Berlin, making her, at the time, the youngest person ever to win an Olympic gold medal. 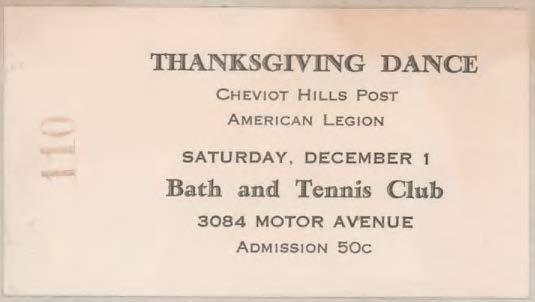 In 1937, the Cheviot Hills Garden Club was meeting at the "West Side Tennis Club." ( Garden Club History 1937 .) It was still meeting there in 1950 ( LA Times, Jan 5, 1950 ) and into the 1970s ( LA Times, Nov. 9, 1972 ). Indeed, many area groups (such as the American Legion, Palms Chamber of Commerce , Beverly Hills Republican Club ) have gathered at the site. Aerial photograph (courtesy UCSB ) from September 14, 1937, showing Tennis Club area. Lower left is Cheviot Knolls ; denser neighborhood to right is Cheviot Hills , with Tennis Club's courts in lower section; beneath that is California Country Club; to right top is Monte-Mar Vista ; and bottom right is Arnaz Ranch. Motor Avenue runs across the middle. Two courts, no longer present, are across Patricia Avenue. Aerial photograph (courtesy UCSB ) from September 14, 1937, more tightly cropped to Tennis Club area. Two courts, no longer present, are across Patricia Avenue. Owners of 13 Culver City homes have filed suit in Superior Court against a nearby tennls club, charging it made too much noise, and have asked an injunction to prevent further club operation until it had "toned down" its facilities. Broder and his wife, Beatrice, managers. The 12 couples and one man who filed the suit asked $15,000 damages each. They demanded "modulation" of music, loudspeakers, tennis and swimming events and asked for more complete parking facilities. 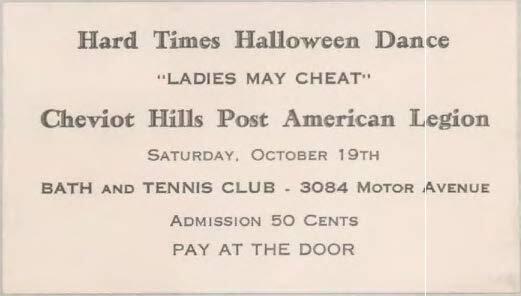 In November 1972, the site was the "Cheviot Club" ( LA Times, Nov. 9, 1972 ) or "Cheviot Hills Club" ( LA Times, Nov. 11, 1972 ). In December 1985, when the Los Angeles Time reported "Racquet Club Scores Win Over Neighbors," it was only the beginning of the match. Failing to make their case before the Los Angeles Board of Zoning Administration over traffic, noise, parking, and public urination associated with the club, they would go to court. The article is full of information concerning ownership, membership, and why the club in the residential neighborhood had the right to keep operating as it had. When Knight Development Corp. bought the Westside Racquet Club last year, the new ownership expected neighbors to welcome plans to refurbish the run-down, 60-year-old facility that once was a retreat for such Hollywood luminaries as Humphrey Bogart and Errol Flynn. Owned in the past by, among others, Ernie Kovacs and Jack Lemmon, the Cheviot Hills club at 3084 Motor Ave. has fallen on hard times. The roof leaks, the kitchen is outdated and repairs are needed everywhere, according to Gene Axelrod, president of the corporation. "We thought the people living near the club would welcome us with open arms," Axelrod said. "We planned to fix up the facility, bring it up to modern standards and develop it into a first-class recreational and social club. "Surprise! We have not been able to overcome the fears of a small group of homeowners who refuse to believe that we will be good neighbors. They have opposed us at every opportunity, despite our best efforts to reach an accommodation with them. We still intend to be a good neighbor." The company will have a chance to stand by its promises. After winning approval to proceed with construction, refurbishing is due to begin Monday. Opponents of Axelrod's plans would like to be able to accept his assurances, said Jerold Steiner, a board member of the Cheviot Hills Homeowners Assn., which has led the fight against the club. "The problem is," Steiner said, "that we want more than assurances. We want controls to be placed on the operation of the club to guarantee that there will not be excessive noise, parking in the neighborhood and a general intensification of activities at the facility. "In the past, neighbors have had to live with all of those problems--noisy parties until all hours of the night, parking in the neighborhood, urinating on people's lawns when they leave the club. While we recognize the club's right to exist, we will accept nothing less than tight controls to preserve the tranquility of the neighborhood." Steiner and Axelrod made their comments after a Los Angeles Board of Zoning Administration decision Tuesday that allowed Knight Development, a Hawaii-based developer, to refurbish the building without a public hearing. Axelrod said he plans to rename the facility the Beverly Hills Country Club, charge members a fee of $5,000 or $8,000 and provide them with "first-class" dining, health, exercise and relaxation facilities. He also plans to provide such business amenities as offices and limousine service. The Cheviot Hills Homeowners Assn. and two other complainants had argued that a public hearing was required under city law because the developer was planning to change the operating conditions of the club established by the zoning administrator 30 years ago when the clubhouse was expanded to its existing size. The homeowners maintained that the only approved uses for the existing facility are tennis, swimming, a limited number of gym activities, casual dining and drinking. After listening to nearly six hours of arguments from both sides, the board ruled 3 to 1 that a public hearing was not required and that Chief Zoning Administrator Frank B. Eberhard was correct in approving the refurbishment because there was no increase planned in the size of the 34,000-square foot structure. Board members and Eberhard expressed sympathy for the homeowners and said that they will closely monitor both Knight Development's building plans and future club operations to ensure that club activities do not disrupt the neighborhood. "We heard the words of assurance from Eberhard," Steiner said. "We simply do not think they mean anything." The association will meet Monday to consider several options, including a possible appeal for a City Council hearing, a lawsuit and meetings with Axelrod to reach an agreement on operations that satisfies the club's neighbors, Steiner said. Steiner said most of the approximately 1,800 homeowners in the area support the association's position on the club. This does not include Country Club Estates , a group of 450 homeowners who have reached an agreement with Knight Development Corp. to submit disputes to arbitration. Eberhard said in an interview after the hearing that he and board members were frustrated by the case and the action taken because they sympathize with neighborhood fears about future operation of the facility. "But as a matter of law," Eberhard said, "we cannot act on fear or speculation. We can only deal with violations when they occur – and we will act if there are violations." He said that such a facility could not be built in a residential area today and that had he been the zoning administrator in 1955 he would have imposed tighter restrictions on the club's activities. "But that is knowing what I know now," Eberhard said. "The rights of the club were established in 1926, when it opened, and in 1955 when it was expanded. You do not lose those rights unless you violate the law and become a public nuisance." 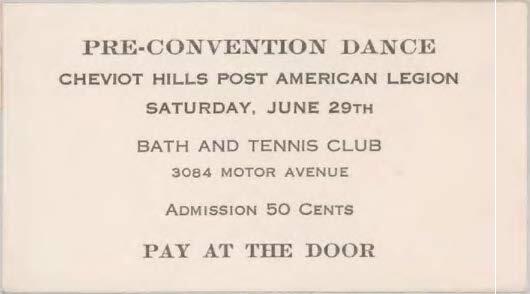 By the start of 1986, the Cheviot Hills Homeowners Association had sued the City of Los Angeles challenging its approval of the club's renovation. "Carlyle W. Hall, Jr., attorney for the association, said the association wants strict controls on the club's hours of operation, parking and noise." The news story said the club's board of directors included " Armand Hammer and Fred Hartley, actors Tom Selleck and Jim Nabors and educators Charles E. Young and Norman Cousins ." Bloomberg lists the following on the Beverly Hills Country Club's board: Buzz Aldrin , Gene Axelrod, Bjorn Borg , Yvonne Burke , Chris Carter, Jimmy Connors , Barbara Eden , Robert Finkelstein, Lawrence Gordon , Dale Gribow, Merv Griffin (1925-2007), George Hamilton , Peter Kelly III, Sherry Lansing , Chapin Hunt, Frank Jobe (1925-2014), Spencer Johnson, Rafer Johnson , Phil McGraw , Leslie Moonves , Jimmy Murphy, Jim Nabors (1930-2017), Matthew Perry , Wolfgang Puck , George Schlatter , Tom Selleck, Nancy Sinatra , Tina Sinatra , John Tunney , Arthur Ulene , Andrea Van de Kamp, Gary Wilson, and Harvey Zarem. Bloomberg also lists Beverly Hills Country Club's "key executives" at : Greg Walker , Tennis Professional; Sara Berger , Catering Director; Paulo Hexsel , Executive Director of Tennis; and Trevor Sands , Director of Tennis. Singerman Real Estate, a Chicago investment firm, and Meriwether Cos. , a Boulder, Colo., hospitality and resort development company, bought the four-acre property near the Santa Monica Freeway south of Century City. Terms of the sale were not disclosed, but the new owners promised to spend $10 million on renovations to the dated complex. "The Beverly Hills Country Club has served the local community for almost 90 years," said Meriwether Cos. Managing Partner Graham Culp . " And we are excited to help ensure it remains a place for Southern California families to gather and socialize for the next 90 years." "Our hope is that it will become a place for entertainment industry types who could meet here on neutral ground and hold meetings and events. And for our high-profile members, we want to make it a safe environment." Ty Burrell , Josh Gad and writer Chris McKenna (whose credits include Spider-Man: Homecoming) are some of the members who enjoy the family-oriented, paparazzi-free zone. The main clubhouse features a new staircase and bay windows; works by local artists adorn the walls; Jeff Torin , formerly of Petit Ermitage, has been brought in for the dining (casual California fare, including standout short rib mole tacos). The refashioned upstairs bar is complemented by a poolside bar (take that, Soho House). Fitness areas were upgraded with state-of- the-art cardio machines, a newly outfitted weight room and a Pilates studio. Locker rooms were given a fresh finish with retro-tiled showers. Woodland Hills-based design firm Creative Resource Associates worked with blues, neutrals and warm grays to modernize the interiors. Over the past two years, more than half of the club's old guard opted out of the new vision, which includes a stricter membership policy and a revamped fee structure. But director of membership John Myers says that defectors already have been replaced, and there are currently about 1,500 family and non-family memberships. One-third of members live locally in suburb-like Cheviot Hills (once home to Lucille Ball, the neighborhood also has bragging rights to the Modern Family house), where the median residential property value is $1.8 million — up 2.9 percent over 2016, according to Zillow . The one-time entry fee for Griffin Club ranges from $4,000 to $10,000 — well below the six figures at most L.A. country clubs (but Griffin doesn't offer golf). Still, the club shares the selectivity of its pricier peers: For the foreseeable future, it will be expanding by invitation only, with prospective members required to have at least two current member referrals. Hervé Lévy has been the club's general manager and chief operating officer since 2015.